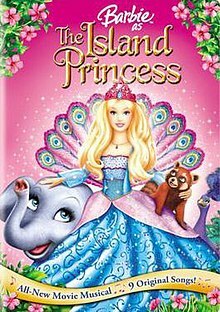 Barbie as the Island Princess is a 2007 American - Canadian direct-to-video computer animated Barbie film. It is part of the Barbie film series, a series of CGI Barbie films, the second to be a musical, and the first movie of Barbie animated under the name of Rainmaker Animation though it was animated by the old Mainframe Animators only. The film features the voice of Kelly Sheridan, who has been voicing the female protagonist in all the CGI Barbie movies to date, as Rosella. After a violent storm, Sagi, a wise red panda and Azul, a flamboyant peacock discover that a six-year-old girl has been shipwrecked on their island. They and a baby elephant named Tika, decide to help her. Over time, she learns to talk to animals, but fails to remember anything about her past before the shipwreck, including her name after Ro. Her only clues are a battered trunk with a broken nameplate "Ro" and a shredded flag with a white rose. Ten years later, a handsome prince named Antonio discovers Ro's island. She saves his life when crocodiles attack him and his friend Frazer. Grateful for her help, Antonio asks Ro if she would like to return with him to his kingdom, Apollonia. Hoping to discover her past, Ro agrees as long as her animal family can come. During the voyage back, Ro and Antonio begin to fall in love. When they return, Antonio introduces Ro to his parents, King Peter and Queen Danielle as well as Antonio's younger sisters; the triplets Rita, Gina and Sofia. While the little girls immediately love Ro and her animals, Danielle is unsure what to think about Ro while Peter doesn't like her at all. The king becomes even more disturbed by his son's obvious affection towards the "uncivilized island girl". Ro does, however, succeed in earning the friendship of the queen's pet monkey, Tallulah. Peter is determined to have his adventurous son settle down and marry. While away, he arranged for Antonio to wed Luciana, a princess from a neighboring kingdom. Like the prince, Luciana doesn't want to marry someone she doesn't love, but is forced to be a puppet in her mother's schemes. Unknown to all, Luciana's mother, Queen Ariana is plotting to kill Antonio's family at the wedding and overthrow their kingdom, although Luciana is not wanting to help her mother, as she is much too kind and also befriends Ro. Queen Ariana's motive is revenge for her parents, who were banished and reduced to pig farmers for the attempted murder of Antonio's parents years ago. The queen sees Ro as a threat to her plans and quickly plots to dispose of her. Over the next few days, Ro repeatedly tries to please Antonio's parents, but due to Ariana's interference, they all end in disaster, which further increases the king's dislike of her. By now, Ro feels like she doesn't belong in Apollonia and thinks about returning to her island, but her love for Antonio and determination to find out about herself convinces her to stay. Trying to cheer her up, Ro's animals and Tallulah help her dress for Antonio and Luciana's engagement party. Thanks to their efforts, Ro arrives in a stunning dress while her grace leaves all the guests impressed, including Peter. When Antonio confesses to Ro that he loves her, Ro reminds him of his pledge to Luciana. After a dance together, she leaves and spots a carriage outside the castle bearing the same design as the flag found back on the island. The carriage's horse tells Ro that the flag belongs to another neighboring kingdom called Paladia, but the duke and duchess (the carriage's owners) only had sons; no daughters. Fed up with his father's attempts to push him into marriage, Antonio writes a note for Ro, saying that he wants to run away with her instead of marrying Luciana. Tika witnesses this and decides to hide the note from Ro, fearing that Ro will leave her. As part of her plan to get rid of Ro, Ariana has her three pet rats put a deadly sleeping herb called "sunset herb" into the food of all the animals in the kingdom. The next day, animals all over the kingdom are unable to wake up, and Ro is blamed for the epidemic. The king has Ro locked away in the dungeon, and during that time, the "Prisoner food" that Azul eats also contains the Sunset Herb, and he too falls into a deep sleep. When Antonio begs for her release, Peter makes his son a deal; If he marries Luciana, Ro will be freed. Ro is banished from Apollonia and placed on a boat that will take her back to her island. On the journey, Tika confesses how she hid Antonio's note, and Ro forgives her. The entire group are then thrown overboard, as Ariana had paid a man to sabotage the boat. When Ro almost drowns and Sagi attempts to come for her, her memory is triggered of how she was lost at sea as a child, and of a man yelling her real name; "Rosella". Ro manages to call dolphins for help just in time and they bring the group safely back to shore. As Antonio and Luciana's wedding starts, Ariana sneaks some of the sunset herb into the wedding cake, with a little bird named Tiny witnessing it. Ro arrives and quickly starts to make a rose tonic antidote for the poison. Tiny comes to her and tells her that Ariana poisoned the wedding cake as well. She almost completes her task when the king's guards discover her. Sagi escapes and takes the antidote to Tallulah, who has been poisoned as well. One of the guards chases after him, but Tika takes him down. The other guard is about to lead Ro back to the dungeons. Hearing about the commotion from Tika, who enters the wedding room just as it is about to start, Antonio, Luciana, Antonio's parents, Ariana and their guests hurry to the greenhouse, disrupting the wedding. Antonio is ecstatic to see Ro again, while Peter demands that she be thrown in prison for daring to return. She tries to explain the animals have really been poisoned and that she can cure them. The king is hesitant at first, but then a cured Tallulah appears with Sagi, showing that Ro is telling the truth. Ro then exposes Ariana's plot to everyone. Ariana denies it, but a shocked Luciana confirms Ro's story by saying that her mother had told her not to eat any wedding food. Exposed, Ariana tries to make a getaway in the wedding carriage, but after a long chase scene, is eventually stopped and captured by falling into the pigs' pen, which is her only fear from her past. The king apologizes to Ro and his son. He gives the couple his blessing and embraces Ro. She tells the royal family that her real name is Rosella. A guest behind them, Queen Marissa from Paladia, overhears Ro and comes forward. She tells them that she had a daughter named Rosella. Ro pauses and then starts to sing a lullaby she knew since she was little. Marissa joins in to complete the song, realizing that Ro is indeed her long-lost daughter and that Rosella is princess of Paladia. Antonio, his parents and Rosella's animal friends, including the now awake Azul, watch as the reunited mother and daughter embrace. Rosella and Antonio are promptly married. Luciana also attends the wedding and meets a handsome young prince. The happy couple, Rosella and Antonio, wave goodbye to everyone as they set sail on a honeymoon voyage with Sagi, Azul, Tika and Tallulah in tow. 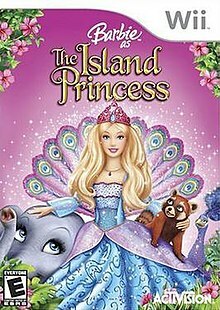 Barbie as the Island Princess is a 2007 platform video game based on the movie for PlayStation 2, Microsoft Windows, Wii, Nintendo DS, and Game Boy Advance. Developed by Human Soft and published by Activision, it is a collection of 28 different mini-games. ^ "Barbie as the Island Princess". Barbie. Retrieved 9 December 2013. ^ "Barbie as the Island Princess (2007)". The New York Times. Retrieved 7 February 2013. ^ Sullivan, Meghan (January 31, 2008). "BARBIE AS THE ISLAND PRINCESS REVIEW". IGN. Retrieved December 16, 2018. This page was last edited on 1 April 2019, at 19:58 (UTC).